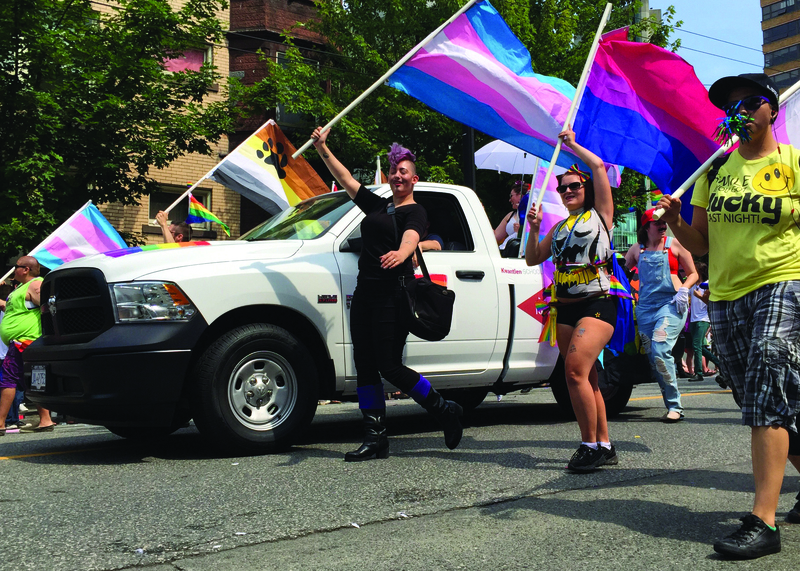 Members of Pride Kwantlen took part in the festivities at the annual Vancouver PrideParade on Aug. 2 to represent and celebrate Kwantlen Polytechnic University’s LGBTQ community. 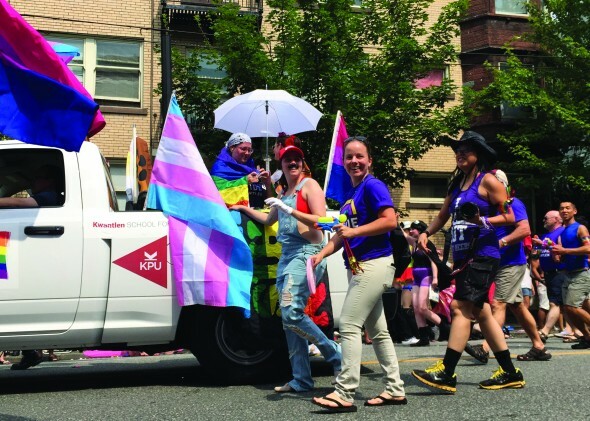 As with previous years, Pride Kwantlen members drove a float in the yearly parade. Spearheading Kwantlen’s participation in the event was Kwantlen Student Association (KSA) queer representative Kayla England. Pride Kwantlen began preparations for the parade as far back as December, and over the course of half a year held several planning and brainstorming sessions, drawing students from both its own membership and from the KSA itself. “Pride Kwantlen is a collective of students who identify as queer, and it’s a safe space to meet and to share their feelings and to gain resources if they need anything,” says England. The Vancouver Pride Parade is the largest event of its kind in B.C., held largely to celebrate diversity and inclusivity in Metro-Vancouver’s LGBTQ community. It’s also well known for its eccentric and electrifying atmosphere. Of course this year’s parade requires a new and original theme. After bouncing around a few different ideas for 2015, Pride Kwantlen selected a ‘gender-bending super heroes’ motif. 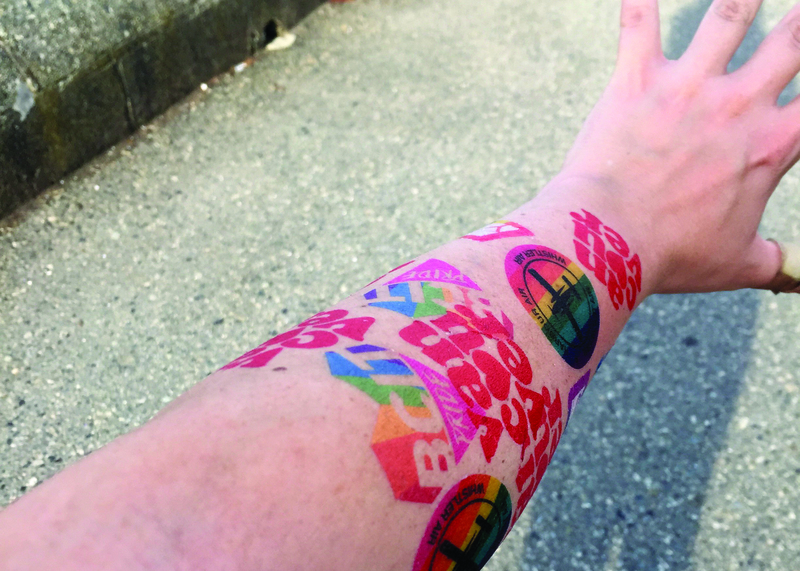 Pride Kwantlen members have designed their own costumes for the event including, but not limited to, gender-bending riffs on Harley Quinn (or Harley Queer) and Wonder Woman. Driving the float was none other than Kwantlen president Alan Davis, who was also involved with the parade last year. Pride Kwantlen’s involvement in the parade comes as the result of the efforts of plenty of people involved with both the KSA and Pride Kwantlen, but England specifically singles out a couple of people for their role in the organization process. Josephine Wong was instrumental to the application and logistics process, while Kari Michaels was important to the float’s creative direction. A key difference for Pride Kwantlen’s plans this year was an emphasis on keeping the display simple. In years past the group’s plans have ballooned to the point of becoming expensive and difficult to manage. This year more importance was placed on personal creativity by Pride Kwantlen Members. The emphasis on simplicity proved to be worthwhile as the project ended up being completed with a mere $500, well below the original $2000 budget. Pride Kwantlen was also involved to some extent with Surrey’s Pride Day, but was unable to be involved with Langley’s events due to restrained resources. In the future, members hope for greater support from the university to provide more for KPU’s queer community. At the top of the wish-list is to one day have a full-time queer representative on staff. “If we could get more resources we’d love to be involved in a lot more things,” says England.